The 2017 CBR600RR Is Here! 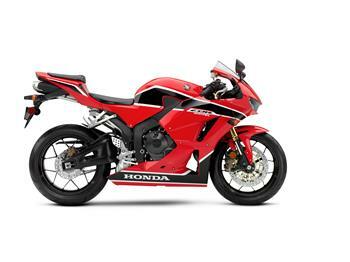 With inspiration taken from Honda's ultimate RC213V race machine, the 2013 CBR600RR boasts advanced racetrack performance as well as improved capabilities for riding on twisty roads and city streets. 22 August 2012 - With the introduction of Honda's new CBR600RR - complete with a brand new Victory Red/White livery - Honda's Supersports line-up has been taken to new heights. 24 June 2009 - Honda has introduced a new Pearl Sunbeam White tri colour (white/red/blue) to its current CBR600RR model line up. 30 January 2009 - The 2009 Honda CBR600RR proves just how good a sports bike can be, and features a list of improvements from its Championship winning predecessor. 10 September, 2008 - Honda Australia has introduced an exciting new colour scheme for the CBR600RR available now through Dealers nationally. 9 September 2008 - The recently crowned AMCN "Motorcycle of the Year" - the CBR1000RR - has always been renowned for its unique look, strong performance and responsive control. The all new Championship winning 2007 Honda CBR600RR, completely redesigned from stem to stern, is now available in Honda Dealers nationally.